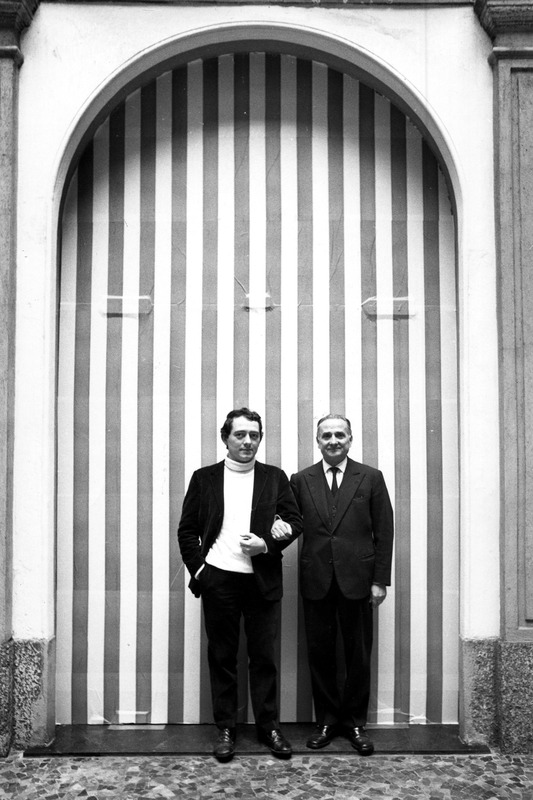 With a career spanning over 50 years, French conceptual artist Daniel Buren continues to playfully integrate stripes and basic geometric shapes into the public sphere, architectural form and function, the gallery space (on his own terms) and public consciousness worldwide. 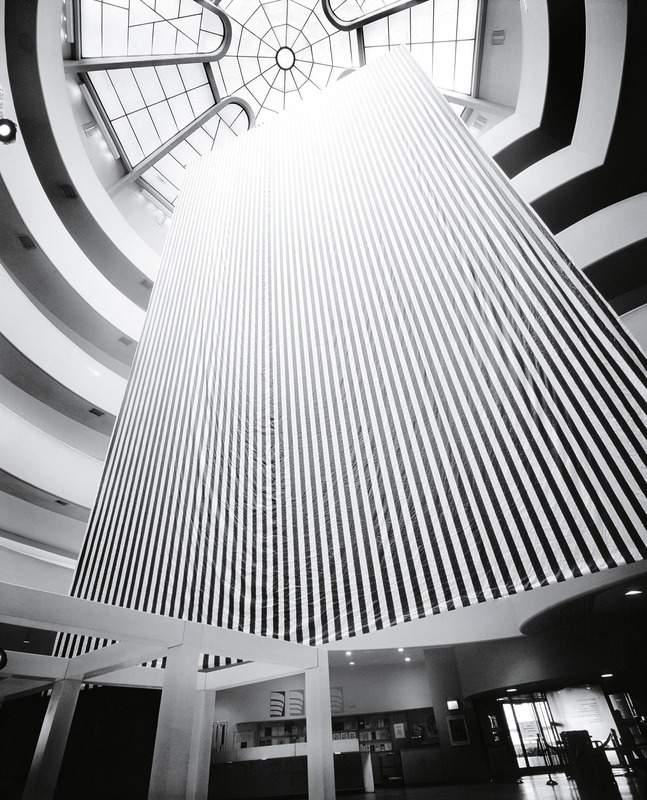 From the outset, Buren has engaged in radical critique of the institutionalized nature of the art world, challenging assumptions to do with art production, working methods, authorship and art as an autonomous commodity. He has chosen to work in situ (site-specific) with minimalist reduction to the “zero degree”. 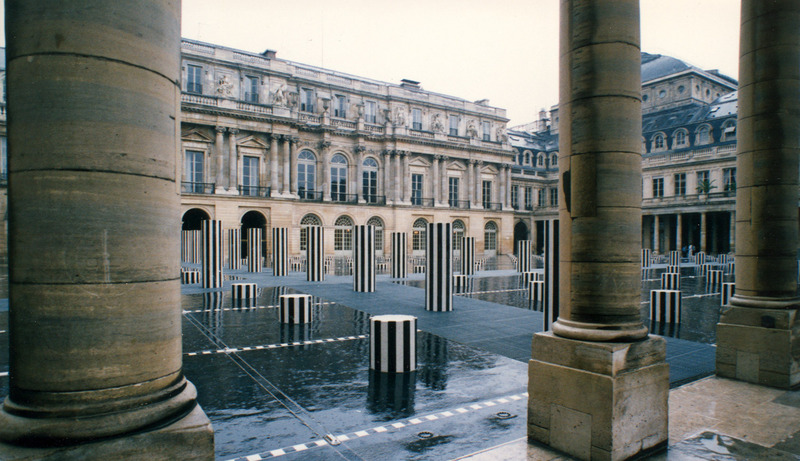 Buren worked together with artists Olivier Mosset, Michel Parmentier and Niele Toroni in this manner against the established order between December ’66 and October ’67. 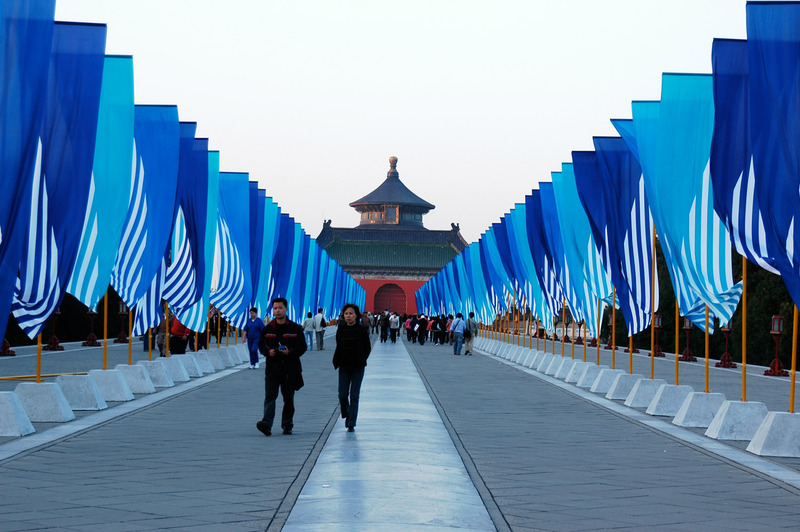 Art critics wrongly dubbed the association BMPT after the fact, Buren says. It was, however, his unsolicited in situ works in the streets of Paris that captured the attention of the art world. 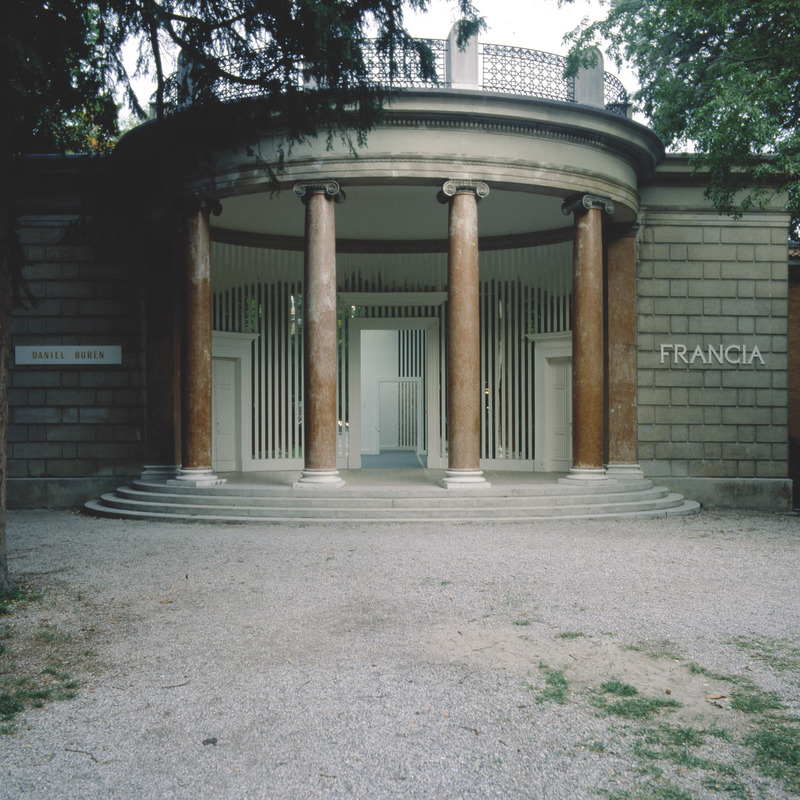 Buren then chose to boldly obstruct the entrance to his first solo exhibition, in 1968 at the Galleria Apollinaire in Milan, with his white and green stripped paper that echoed the form of the structure and entirely sealed the door shut. The door remained sealed for the duration of the show. Early on, Buren co-opted the vertical stripes of French furnishing fabric for their neutrality and banal familiarity. He uses them as “visual tools” to neutralise style, subjectivity, representation, narrative, expression, the artist’s hand and accompanying notions of heroicism. In order to create works of art that are not weighed down in art assumptions but works that simply exist in a visual and material sense, literally as facts. Works are created in situ on site with consideration to the social, cultural, functional, and structural implications and interactions of the surrounds. The stripes (always 8.7 cm wide, alternating white and colour, and vertical) act as “visual tools” drawing attention to the unique concerns of the environment in which they take form. 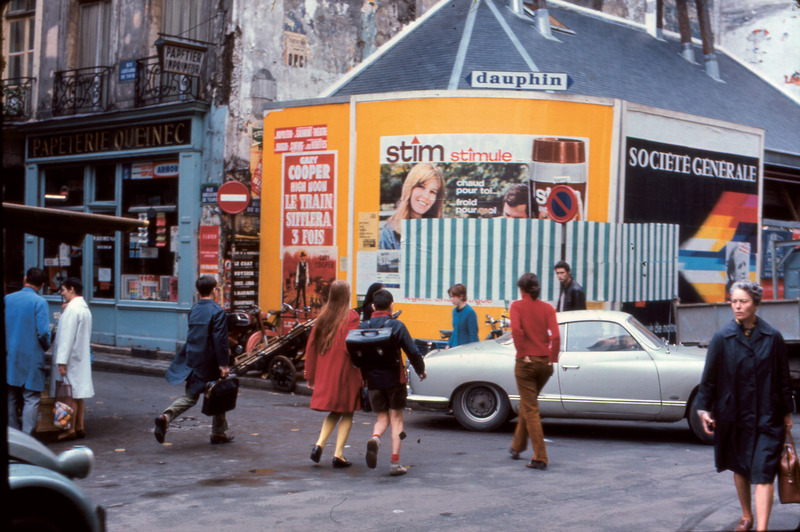 In the late 60s, Buren pasted his unauthorized Affichages sauvages throughout the streets of Paris and later on Metro platforms. Among diverse structures and sites, he often chose to hi-jack spaces reserved for advertising, casually negating their sanctioned purpose. The viewer is forced to experience the site in a new way. This radical gesture showed that art could possess a public role; it could exist freely in public space without the gallery system or status as a commodity. Art could exist purely as a visual and material element in the everyday experience. These liberated sites soon revealed traditional art conventions (and advertising) to be rather tiresome and the possibilities for interactions between cities and art immense. 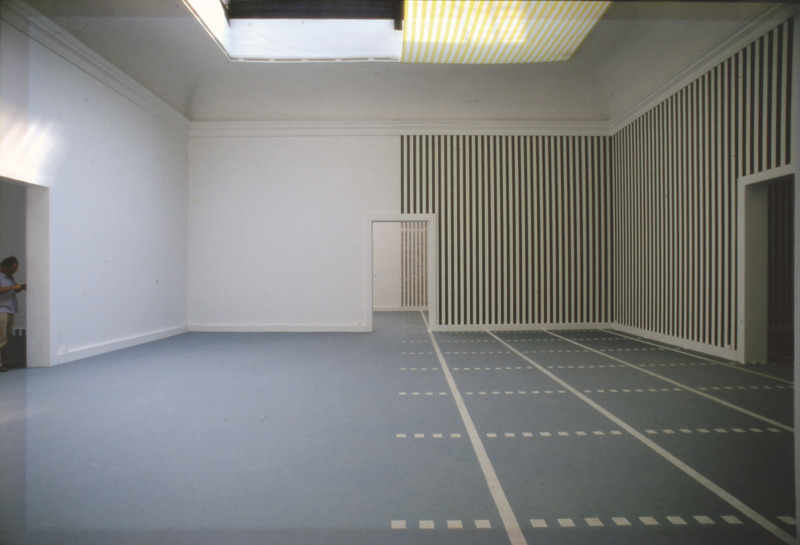 Over the course of his career, Buren has created works in situ inside and outside the gallery in both a solicited and unsolicited capacity. 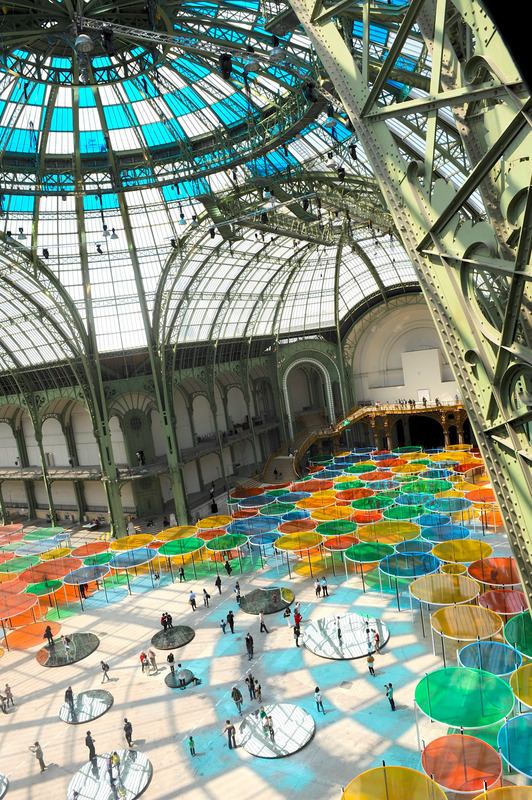 His in situ interventions (permanent and temporary) grace architectural structures, façades, cultural sites and cityscapes around the world, including at the Guggenheim Bilbao, Tottenham Court Road station, the Observatory of Light at the Fondation Louis Vuitton and Les Deux Plateaux at the Palais Royal. Lodown reached out to Daniel Buren, who was in London working on his next project, to find out more about his art and his outlaw Affichages sauvages. Can you talk about working in situ? What does it allow and why does this resonate with you? First of all, at the end of the 60s I first used the terms “working in situ” or “works in situ” as much as such Latin locution are used inside the common French language like (in vivo, a priori, a posteriori, vice versa, ad hoc, ad infinitum, and thousand more…). I believe that it was not used yet inside the art vocabulary. Second of all, almost no one (outside of France) was able to understand the meaning of that locution and I was forced to explain each time (in Germany, in the States, in Japan, in Australia etc.) the meaning of what I was writing. Today, it’s so well known everywhere inside the world of art that in situ has become almost one of the new art categories! And the way it is generally used is far from the use I wanted to imply i.e. work done directly within the site (for it, against it) visible at the very same place (and not transportable), often destroyed after consumption. The result of such works and attitude was first of all, extremely difficult to sell anything to anyone because the accent was also underlying: such work cannot be easily (almost impossible) transferred to somebody else. So, a cut inside the capitalist market based on infinite exchange of goods. At the same moment, such work in situ means a direct physical, historical, political, social, architectural etc. relation with the specific site where such works are, then the major difficulty to transport such works someplace else (when it’s not just sometimes physically impossible) will, by definition, partly loose all their main interest, if any. These parameters and others are strong for me even today where the majority of my works are still made in situ. 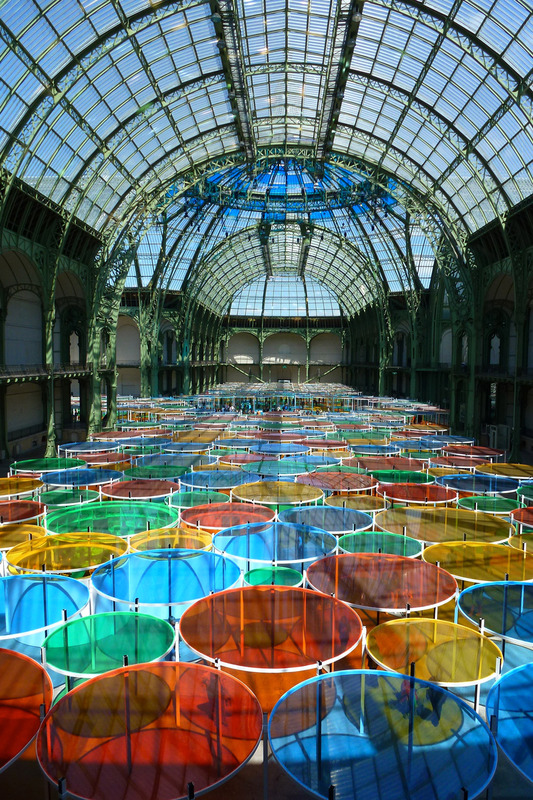 And why are you interested in the site-specific relationships, interactions and considerations (between location, architecture, form and function, cultural context as well as audience) that come into play over creating an autonomous work of art, which is stand-alone? Exactly. The other aspect of the meaning of “work in situ” is the one immediately linked with such definition: such a work immediately and automatically loses its autonomy. Such aspect cuts a deep ideological break inside the western art history, particularly the one which is to be autonomous. My work on the contrary (and it’s part of its fragility too) is never autonomous (even if not specifically in situ). This cut with such a strong belief in the artistic doxa is very interesting for me and opens a series of questions about autonomy in general and where, and about finally which autonomy they are speaking about and if such thing exists? So, at least, I affirm that my work is not. When and why did you start working in situ and how did the working method/concept develop? Funnily enough, (but without any conscience knowledge of it) my very first work, done publicly for a Hotel in the Caribbean, was done in situ during the year 1960/61. Then, after a long period of doing experimental works and paintings, I came back very seriously to works done in situ (end of 1967) and haven’t stopped since. And would you say it has become one of your “core” conceptual concerns or just one of? Just one of, but certainly the most important, because from it starts a lot of consequences which oblige a lot of changes in the practice of working. To begin with the total abandonment of any studio to work in, for example! Can you talk about your Affichages sauvages project on the streets of Paris: how the project came into being, the intention, the meaning of the name, and how it evolved? 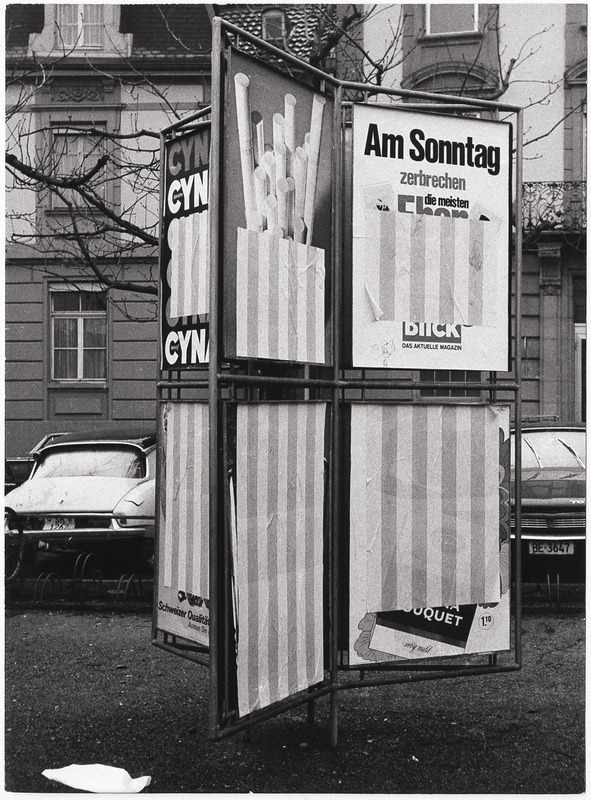 “Affichages sauvges” was in fact the very first physical “work in situ” with a theoretical consciousness of “what and where” such a concept can lead. The name “affichages sauvages” came from the following meaning: work done without any authorization, with no sponsor, with no one paid and only, at my own risks and perils! Because of my experimentation over hundreds of different nights and works outside and what I learned from it, I first learned how the city really works; how the neuralgic points are controlled or control the situation. Also where the works of art (statues, fountains etc.) are displayed inside the city and why certain quarters are full of them while others, completely void of such stuff. The second thing I learned by manipulating the posters was the flexibility of the material, its solidity and its very little cost. After such experiences I had no problem to use the very same material directly inside galleries or museum as soon as I was invited inside their walls. Then I developed (and still do) all the quality of the material paper, which allied a beautiful plasticity to a rather astonishing very long solidity and a very quick use of elements (speed of being positioned for example, speed of drying etc.). In terms of evolution, the way to use it amplified but we can speak more in terms of developing new materials and enlarging particularly this medium, than an evolution in terms of doing better or bigger with the time. As for the vertical stripes, you have described them as “fundamentally banal” and “visual tools”. Can you explain how the stripes entered your oeuvre and what have they come to symbolise/represent/achieve in your work from a conceptual standpoint? In fact, I was working since at least four years (from ’61 to ’65) in doing abstract painting with which I was trying to approach a zero degree of painting. To try to do so, I wanted to reduce as much as possible all the tricks which finally give a painted surface the look of a painting. First of all, to destroy all personal gesture. To do so, I was covering the full surface of my support, at this very time I was painting on coloured bed sheets (as canvas), with a series of masking tape (around 4/5 centimetres width) parallel to each other and vertical toward the floor. Then I was overpainting (with a brush) with some different colours (or only one) the full surface. When this was done I was taking away all of the masking tape and we were in front then, of a new surface totally striped with similar vertical stripes all the way along. Finally, in front of this newly striped surface, I was organizing some full shapes, neither geometrical and neither figurative, which I called “indefinite forms” which were more or less floating on top of the stripes sometimes making them totally vanish, sometimes more visible. All these works were still very far from my desire of a non-personal structure, still much too much painterly. By chance, later on, going to a big department store with all sorts of linen or canvas in Paris to buy some material, I was at one point just in front of a series of striped cotton like awnings but much lighter, for doing mattresses or cushions, all striped with equal stripes which was looking very close to (but much better) what I was trying to do with my masking tape. So I decided to buy a few metres of it right away and I started to follow what I was doing just before on my striped surface made by hand, but directly on the stripes already made. That happened in November ’65 and since that date I started to use this striped linen, which gave to me the measurements of everything I wanted to do after (8.7 cm width), till today a little over 50 years later. I just want to add that, when I started to use these stripes I was never thinking that I would use it for so long with absolutely no escape. This was not programmed but led my work all the way along. And do you work with set width measurements or is this variable? The main things, which are non-variable aspects of these stripes are: the succession of stripes white, colour, white, colour etc. The size of the stripes (always 8.7cm wide). The colour white (immutable) alternatively with any other colour existing. The strict repetition of these elements inside the full object, printed in order to form any forms depending on the given situation/location is the main reason for which I dare to name these elements “outil visuel”/“visual tool” – used in any and all pieces I’ve done since that time – because, as the metre is the reference for the country which established the metre as their measurement base, such a measurement is always the same exactly in whatever the country it is used. So for example, if you know already the use of such vertical stripes in the visual domain, you can count the number of stripes. For example, you get to count up to the number 25 and you can deduct from a certain distance (without any other tools than your eyes and your mental ability to count the number of stripes), that we are in front of a wall, a segment or any other portion of a wall, a ceiling or whatsoever defined by these 25 stripes tell us even from a distance that this portion has 217.5 centimetres width! This is only one small aspect and one result of the immutability of this “visual tool”. Some other effects of this tool are evident as, for example showing a kind of a signature about who did a work, a priori you might not recognize! Instead of explaining what is this new formal work in order to follow the sense of it, the presence of the stripes (even if discreet) make the economy of an explicative text or a long discourse. So the stripes can have a million different colours, thousands of textures and materials used to make it but have always (since 1965) had exactly the same width, the white as a reference, and the verticality (never horizontal). All around the use of stripes the sites are always different, the material in use totally open, so around them everything changes all the time as much as necessary. I understand that charm and not necessarily stealth (or hooligan force) allowed you to execute your works in public in the late 60s and on the Parisian Metro in the 70s. Can you talk about your working methods and public perception at the time: Were your unsolicited street interventions viewed as vandalism or met with curiosity or bemusement? And was there a need to work clandestinely when working in the streets or were you able to work openly? You first have to understand that by order of decision, I first decided (around October 1967 after months of reflection around that matter) to quit completely the place I was working in (called pompously a studio but in fact which was a quite small underground room with a mere opening on the ceiling where the natural light was making a glimpse during the day). I decided to quit definitively not only that space so uncomfortable, too small (with only one usable wall), but to stop, at least for a while, to look for any other places and see what can happen if someone wants to continue to work in the same field of visual art (painting, sculpture, object…) but without a specific space to work and to make it. My first opportunity then was: why not to use the streets looking so free and waiting for experimentation, which I did immediately from December ’67 and developed until now. I must add that, even if that was not a program, I still don’t have a studio and work from place to place wherever people invite me and sometimes as well, when and where I am not invited! What did the art world make of it? It appears to have not negatively impacted your career. I must say that even if I did several things before this decision to work outdoor, even if some of the works I did before gained a little bit of the attention of the Parisian art world, it’s when I started to work directly in the streets of Paris that the art world (outside of the Parisian one) started to pay more attention to such type of works and that I was almost (almost in the sense of quasi-instantly) invited by galleries and museums. It’s also interesting to see that those who were interested to ask me to work with them were foreign people. The gallery Apollinaire from Milan was the very first to be aware and invited me to the first Prospect in Düsseldorf (September 68) where I was simultaneously, the day of the opening, invited by Konrad Fischer who was in charge of this gallery group show but also, just opened his own gallery. He invited me to see his space where a very young artist (who I didn’t know at that very time) was showing (Richard Long) and asked me if I would be interested to show there. Of course I didn’t hesitate half a second and we started immediately to work together. 48 years later, I am still working with this Gallery! The very same day I was invited to show with the White Wide Space from Antwerp, then by Gian Enzo Sperone from Torino and by John Weber who was at that time the Director of the Dwan Gallery from NY and who soon after, opened his own gallery where he invited me to work. As well the Director of the Mönchengladbach Museum (Johannes Cladders) made the proposition to me, to do a one-man show with his museum and we started to work together on this subject matter immediately (it took two years to realize the show). A year later, again invited for the second Prospect (which I did with Yvon Lambert Gallery) I met many others, people from the art world and started to work with Seth Siegelaub and subsequently with the main artists he was already working with like Lawrence Weiner, Joseph Kosuth, Bob Barry, Douglas Huebler, Ian Wilson who all became very good friends of mine. Around that time, I was invited for the VI Guggenheim International in NY (from which I was censored the day before the opening and excluded from the show) etc… So you are right, to decide to quit the use of a studio and to work without external help in the street opened paradoxically a boulevard for my activities. Thanks for such a decision. Are there any memorable moments/interactions from your art bandit days that you would like to share? Between many anecdotical little stories one made more noise than the others. This was the one that happened in Bern, Switzerland during the famous “When Attitude Becomes Form” . I knew the existence of this project (Harald Szeemann commissaire of it, came to visit me in Paris a year before the show but finally didn’t invite me to participate) and most of my best and new friends were invited to participate. I guessed from what I knew that this exhibition would be rather interesting. After thinking about what to do (if to do anything) and having found the money to take the train to Bern, I decided to go there and arrived three days before the opening to study the possibilities. I found all my friends as well actively occupied in making their work for the show inside the Kunsthalle of Bern. Walking around the museum, at one point Joseph Beuys asked me, where was my work? I told him that I was not invited and I was looking for a solution to do something anyhow and to participate in my manner. Surprisingly, he told me: “Look, I have all this room for myself (the entrance room, the biggest in the museum), if you want to use a portion at this end of it with your striped papers, don’t hesitate, I offer you this corner.” I was in front of this extremely generous offer with the choice of either exhibiting inside the museum while not having been invited, or doing my usual gluing of posters inside the city itself, outside the museum. After almost a night of confusing alternatives between the best choice to do, I finally thanked Joseph Beuys and decided to work all the night after (the one before the official opening) only all around the city. To do so, I had the great help of two friends artists, Berndt Lohaus and Lawrence Weiner. With the little car I was renting to do so for the night, we covered the full city with striped papers white and pink. You have to know as well that most of the advertising panels in Bern were extremely cleanly framed and sometimes covered with glass panels. At that time too, the city was still totally exempt of any type of graffiti. Around three o’clock in the morning, I dropped my friends at their hotel and went back to mine. Around four o’clock, sleeping deeply, some heavy knocks shake my door. I wake up and stand up in front of two policemen in civilian clothes with pistols pointing toward me. They push me against the wall of my room and check under the bed where they find my striped papers and at the foot of my bed the bucket with the remainder of the glue and the brushes, which I hadn’t yet washed. They took everything, asked me to dress myself and to follow them to the police station where they put me inside a cell! Then in the morning around nine o’clock some other policemen started to do an interrogation: what are you doing? Who are you? Why these papers? Why are they white and red? In fact, they were white and soft pink. Etc, etc… A friend of mine (lawyer from his official activity and art critique as a hobby) who came to see me and also of course to see the show itself, was in fact captured by the police while asking for me at the hotel and brought immediately to the police station where I was – certainly to confront two dangerous individuals part of a bigger association. He was able to tell them who I was and what I was doing “art in the streets”, part of the big exhibition opening the very same day at the museum! They finally freed me, telling me that they will destroy all the remaining posters they found in my room and asked me to clean all the defaced advertising which I destroyed during the night! As quickly as possible, I took the next train to Paris leaving the city in the state we changed it to during the night. They did try after to do a process against me, if I was not paying for the repairs but I never did so and finally the case was forgotten. Harald Szeemann, who as I said did not invite me to his exhibition, published a post catalogue/book after the show, mainly about works which were done at the moment of the building up of many works the days before the opening, and on the cover of this new book publishes a picture of my night activity in Bern before the opening! Anecdote to anecdote, during the interrogation I ask them how they found me in the middle of the night in my hotel room? They told me that dozens of taxi drivers called the police during the night and gave them the number of my car. Then they looked in hotel parking lots and… they found me! Your art ventures in the streets predate the infamous Situationist-inspired graffiti of the May 1968 riots. When you started experimenting (in late ’67) with mail-outs and pasting your works on paper up in the streets, and then with your Affichages sauvages project (from December ’67 for the very first attempt and extensively from March 1968), what was happening in the streets at the time, were artists experimenting with public space? And were you inspired by the Situationist International ideologies? To my knowledge, in Paris at least, and with the exception of a strong political activities with political “affiches” (almost a cultural/political tradition in Paris since the French Revolution) glued everywhere especially before elections or manifestations, I don’t remember any other type of activities on the Parisian walls. I don’t remember any artist experimenting with anything freely in public spaces. I knew some text written by the Situationists and I was extremely interested by many of their approaches but I never met any of them directly, even Guy Debord who I liked very much and still do. Is there anything you learned from working in situ in the street that remains relevant to your work today? 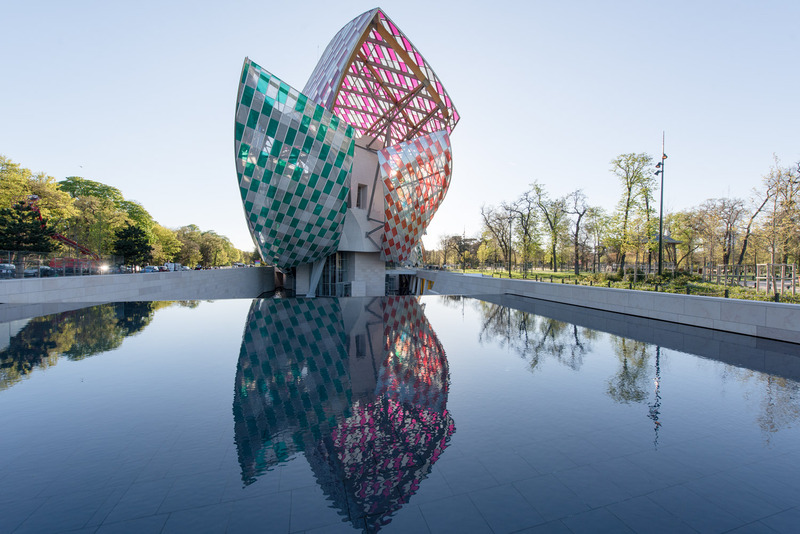 While you are a celebrated conceptual artist both within the gallery system and outside of it, you continue to work in situ in the public domain through large-scale temporary and permanent public art and private commissions, including London's Tottenham Court Road station, Observatory of Light at the Fondation Louis Vuitton arts centre and Les Deux Plateaux at the Palais Royal. What appeals to you about working in the public domain still today? To make my answer short, I will say that any public artwork is confronted, whatever the situation, with the reality of the world as it is in its complexity and difficulty for most of the case. In what we can call the specific art world (I mean the galleries, the Institutions, the Museums, the Kunsthalles, the official Biennales, Documentas, Art Fairs etc… ) even when a group show like Münster for example is partly outdoors, the artist is rather well protected from all the inconvenience of the real daily life (even if sometimes he or she can be confronted with some censorship and bad internal fights). In our western world, so far, an artist invited in the specific location of that world as described above, is really protected to be free to do his/her activity as freely as possible, with very little constraints. It’s not ideal but it’s generally protective. In the public space, all these protections disappear. The freedom is strongly reduced and in addition to all of that, you are constantly confronted with the most unpredictable reaction of the public who can damage or destroy the work or make it impossible! This is maybe the reason it’s so interesting and important to work in public space, because if you get through all the obstacles without reducing your own work into a mere mediocrity pleasing anyone and immediately accepted by a majority of people, you might have then the possibility to show and impose something, which will benefit the greater amount of people. While such a goal will happen with difficulty (if ever) in the museum walls. For what I just said we can understand why many artists refuse to work in public places. I must add as well that such work can be really discouraging and you have to know, sometimes after a lot of time and a lot of work, why you would be better to withdraw completely from a project rather than to be too obstinate and then to be forced to do bad compromises, which will jeopardize your own work.To gain and win more freedom inside the public domain is a goal, which makes the risk of working for it, totally relevant and exciting. Even if it is a “tour-de-force” you can not succeed in realizing every time. And how do you translate in situ (and working against the idea that a work of art is autonomous) to the gallery space? First of all you can do “works in situ” inside a gallery and for a gallery. If the gallery refuses you can refuse to show. If the gallery is surprised and might not invite you anymore, it’s its choice and it’s your own risk. A work in situ, if you speak about business, can give the idea to a collector to have something of that vein and ask the artist to work on a project with such perspective. It’s very rare, but it’s then the duty of the gallery to try to catch the attention of the collector on such possibilities. Of course, it’s not as easy as to leave the gallery with a painting or a photographic work under your arms! Now in a museum as well as in a gallery, it’s possible as well to do works, which I called “situated works”, which mean that they are transportable and that they follow certain rules you have to accept in order to re-construct the piece for example. Everything anyhow is difficult to sell, but in our world everything is as well sellable. What are you working on at the moment? And is there time in your busy schedule for unsolicited interventions? I always work on many projects as different as possible from one to the next, public, private etc… at the same time. Most of the time, I succeed in incorporating a new unexpected project between a dozen in preparation. It’s important to keep your mind and time supple enough for quick improvisation.